Winner of the 2009 EIFLE Award! 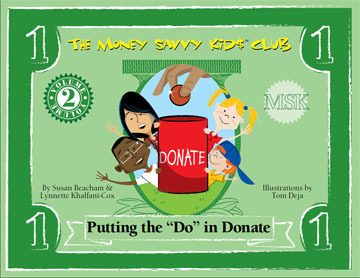 Co-written by financial literacy expert Susan Beacham and New York Times bestselling author, Lynnette Khalfani Cox, the newly published “The Money Savvy Kid$ Club™” children’s book series are not fantasy books. Rather, they are smart, creative, beautifully illustrated picture books which teach children that money is not merely something to be used for buying pizza and the hippest new CDs. Through four funny and engaging stories, a group of childhood BFFs learn that there are actually four things you can do with money: Save, Spend, Donate or Invest. When Isaiah's mom asks him to clean out the family garage, she promises her son that he can keep all the money he makes from a garage sale. Sorting through all those boxes, however, proves to be a very big job. So Isaiah enlists the help of his friends, Sandy, Dennis and Stephanie. 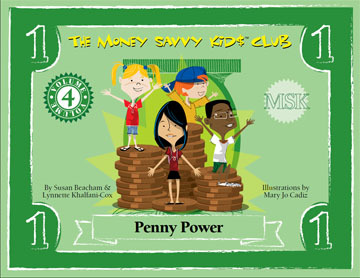 When the four pals start dreaming of what they'll do with all the money they will earn, they name themselves The Money Savvy Kids Club. But after all their hard work, will they quickly waste their money with a trip to Mega Mall - or will they learn a valuable lesson about spending and saving? Dennis can't wait to get to school on Monday to tell his friends about the amazing thing that his Grandpa did. At his 80th birthday, his Grandpa gave Dennis $100! But there's a catch: Dennis has to use the money to help someone less fortunate. With advice from his friends, Isaiah, Stephanie and Sandy, Dennis is sure to think of someone in need. With a little creativity and hard work, the four pals might even figure out a way to turn Dennis' $100 into an even bigger donation. In Social Studies class, it's time to talk about "current events" from the newspaper. 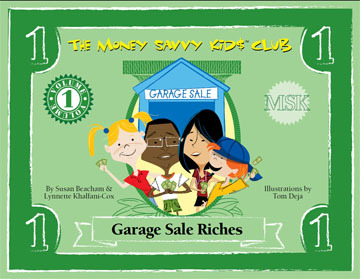 Three members of the Money Savvy Kids Club - Isaiah, Sandy and Dennis - have agreed on a topic. They want to explain why so many homes in the community have "For Sale" signs. But their buddy, Stephanie, doesn't want to talk about this subject. After all, her family may have to sell their home too - and that has Stephanie terribly upset. Stephanie's dad has lost his job and can't pay for their home anymore. So will Stephanie's family be able to save their house? Or will they have to move out, and will Stephanie have to leave the neighborhood and her closest friends? Mrs. Berry's weekend math assignment is one of the toughest ever. In fact, she seems to have gone a little overboard - she thinks pennies have incredible powers! Powers like curing diseases, building schools, and delivering food and medicine. Mrs. Berry wants the class to explain how this can be. 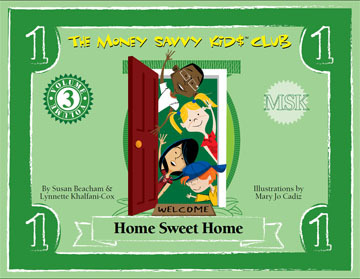 Isaiah, Sandy, Dennis and Stephanie decide that as members of the Money Savvy Kids Club, there's no money problem they can't solve. They're up for the challenge! But as they start their research, they also discover that Sandy has a money concern of her own - her mom has lost her job. Can the pals solve their crazy penny homework and help Sandy feel a little better at the same time?